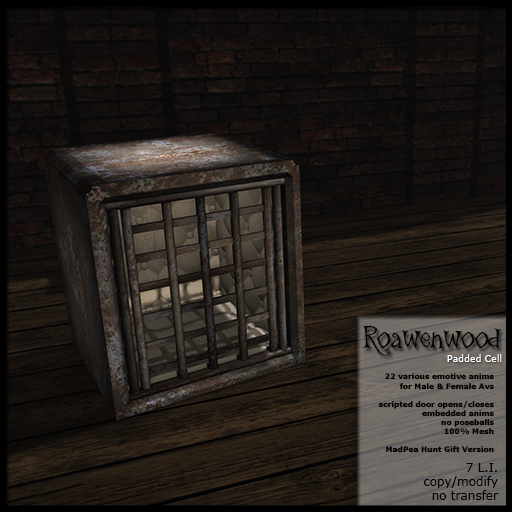 Peatonville Asylum – MadPea Games! MadPea is known for creating some awesome games and things to do in Second Life. This time around they’ve gone back to Peatonville, I believe they did an event surrounding this before and people loved it so much they decided to try to do it again. There’s a lot to do, I know that the games get fairly involved. You have to buy a HUD, go through stores, find clues and shards… a whole bunch of stuff to divert you and at the end game you can get yourself a whole bunch of prizes from some really great creators. I’ve been a part of a few of their games and it seems like everyone enjoys them immensely. This time I got to play around with the asylum theme. Fun stuff…. means I got to make cages……… *grins devilishly* of a sort. Kind of. There are two levels of prizes. Silver and Gold. So if you do the hunt/game I guess depending on the type of HUD you have is what kinds of prizes are unlocked. The silver prize that I put together is a padded cell. I am so terribly warped I know it, I tend to play upon and pick things that can make people uncomfortable I suppose. The padded cell for the game consists of the cell, of course, and it has 22 different animations embedded in it so you can play out some fairly interesting little scenarios if you wanted. This means no poseballs and it has a scripted door that slides back and forth. There are animations for male and female avatars including things like hearing voices, crying, sobbing, panic… plus ones where you’re just sitting of course, or relaxing… as much as you can in something like a padded cell at least. It looks cool if you’re into that sort of thing. I am going to be releasing a full set with and without RLV options for the store after the hunt, for now you can have this. The gold level prize is something called a Utica Crib. I couldn’t help myself. It gave me a tickle when I was looking around at possible things I might like to work on, this “crib” is something that was developed back in the 1800’s not very far from where I live. At least that is where most info points me and it is one reason why it is called the Utica Crib after the place it was designed, the Utica State Hospital (a.k.a. Utica Psychiatric Center). It was the first state run facility for the mentally ill in NY and one of the first in the country supposedly. I haven’t fact checked, so please be kind if I’m in error. Anyhow…. the idea of the Utica Crib was supposedly to create a safe place for patients to be locked up during the night so they didn’t wander. They were supposed to have a comfy mattress and such… called a crib because it was roughly designed to look like and act like a children’s crib giving some semblance of trying to make it a ‘safe’ place except that it well has a cage top that padlocks making you a prisoner. I suppose that’s one difference yes? *coughs* So yes I was intrigued. I decided I must, and so I did. 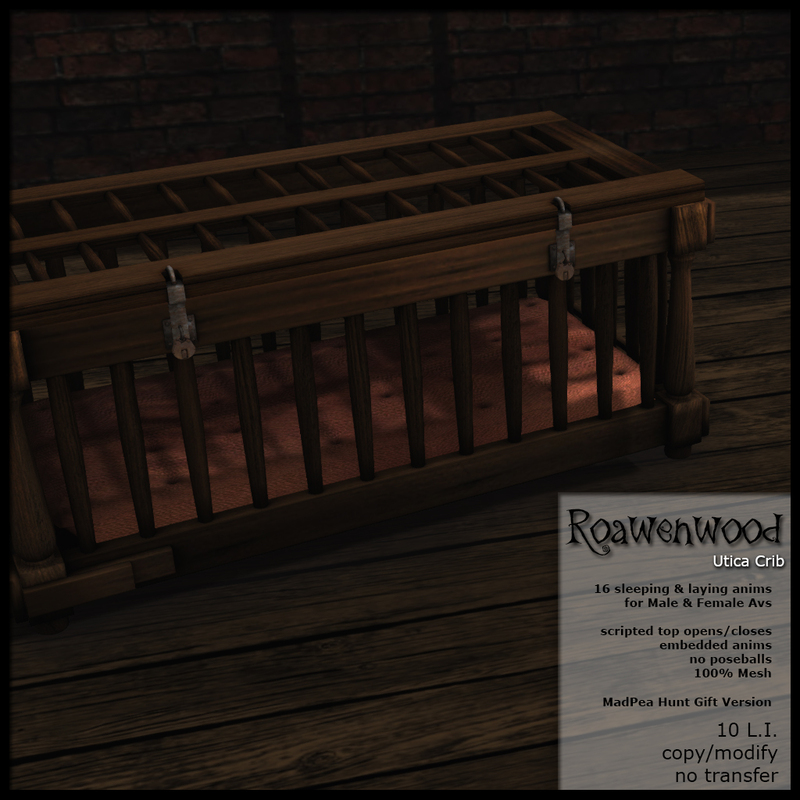 The crib has 16 animations in it for male and female avatars to sleep, recline, while away the time while locked up. The top opens and closes, it is scripted like my other things with Kool doors scripting so it could be upgraded for rp purposes if you wanted. After the game I will like with the padded cell put it into the store with one that has RLV and one that does not as a set…. so you can either play the game, win it with a TON of other stuff from some really awesome folks or… I suppose you could wait, but you know…. the game sounds more fun tbh. You decide! BUT if you want to do the game you need the HUD, and it just so happens that at the landing of my store there is a vendor… big old poster thing that sells the HUDs so if you want to get started you can! Very easily. I hope you enjoy and happy hunting! !